syria – TRUTH IN MEDIA: TRUTH TRUMPS POWER EVERY TIME! Russian president and his officials talked tough in advance of the US-UK-France missile strikes on Syria in the predawn hours today (Apr 14, 2018). 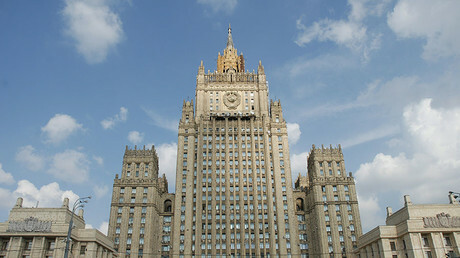 Russia’s ambassador to Lebanon, for example, said on April 11 hat any US missiles fired at Syria would be shot down and the launch sites targeted, a step which could trigger a major escalation in the Syrian war (see LIKE CUBA, LIKE SYRIA?, Apr 11). Well, that did not happen, did it? The tripartite US-led coalition fired 103 missiles supposedly at Syrian chemical weapons facilities. And there was not a peep from the Russian air defenses in that country. Instead, Putin lamely responded in a statement that the US and its allies violated the UN Charter and international law. Whoopee do! Really? That’s what the Russian president expects Washington to obey Spoken like a modern-day Neville Chamberlain. When did the international law ever stop global state terrorists, or imperialists, from pursuing their goals? How did it work for Chamberlain against Hitler? When the push came to shove, the Russian president blinked. Just like Khrushchev did in 1962. Proof? Only fools look for that. Statesmen act to protect their countries’ interests. So what are we to conclude from this? I tell you what: Putin is all bluster and no muster. A wuss. Yet seen as a hero in his country, recently reelected with a huge majority. Which goes to show us that the American people are not the only naive fools in the world. Words are cheap; action speaks louder than words. “Speak softly and carry a big stick” (Theodore Roosevelt). All these truisms have been lost on the Russian president. What’s he going to do with his legal argument about the US breaking international law. Sue the Pentagon? Sue Trump? Sue Netanyahu? Back in 2014, I wrote a Truth in Media editorial “Is Putin Naive or Coy?” Now I can answer that question with certainty: He is a fool if he thinks he can deal with the belligerents like the US, Israel, UK or France in a court of law. Even the former Trump supporters in the US are making minced meat of our bozo at the White House and his shameful turn-about-face on Syria pullout (see the “Conservative pundits are hammering Trump for US-led strikes in Syria”). More and more, Putin is sounding like Boris Yeltsin, who similarly sold out the Serbs in the 1990s during the US-initiated wars which dismembered Yugoslavia, and brought NATO into the Balkans. “History will set things straight on Syria for the US, which is already responsible for a chain of “bloody carnage” in other countries, Russian President Putin said today, following the US-led attack on Syria. And how did the history lesson work out in Yugoslavia? The country no longer exists. That’s how. I fear the only country the “free world” may be able to count on to free us from the slavery to the Israel-controlled New World Order is China. Ironically, that’s a communist country. So I would not put much weight behind the words of the Chinese president, either. Basically, we are screwed. For now. Unless some other leader with cojones bigger than Netanyahu’s emerges. That’s the bottom line. WHO’S AMERICA’S BOSS? NIKKI OR DONALD? ACTUALLY, NEITHER. IT IS BIBI. The US will not pull its troops out of Syria until its goals are accomplished there, US Ambassador to the UN, Nikki Haley, has said. The US currently has over 2,000 troops in Syria and a number of contractors. Haley added that the US wants to ensure that chemical weapons are not used in a way that is of risk to US interests, Islamic State (IS, formerly ISIS) is defeated, and Iran’s actions are monitored.“Be very clear, if we leave, when we leave, it will be because we know that everything is moving forward,” Haley added (click here for more). “We’re knocking the hell out of ISIS. We’ll be coming out of Syria like very soon. Let the other people take care of it now,” Trump said at an Ohio public event. “We are going to get back to our country, where we belong, where we want to be.” (Mar 29, 2018 – see LIKE CUBA, LIKE SYRIA?). This was not the first time Nikki had contradicted Donald and successfully sabotaged the President’s overtures toward peace. Last July, Trump and Putin met for the first time on the sidelines of the G20 summit in Hamburg, Germany,. And it was love at first sight. “I had a tremendous meeting yesterday with President Putin,” Trump said on July 8 while speaking with UK Prime Minister Theresa May. It must have been. The meeting was scheduled to last 30-40 minutes. It went on for 2:16 hours. Even Melania could not pry her husband away from Putin (see https://wp.me/p3QU1S-2kr). ‘We cannot trust Russia & we won’t ever trust Russia’ – she squawked the same day in a CNN interview. Right on cue. Now it remains to be seen who is in charge here – Trump or the NWO foreign policy masters. If it is the former, Trump should fire Haley immediately for insubordination. It is the President, not the UN ambassador, who makes foreign policy. Less than three weeks later, we got our answer. Haley and her backers won. Trump backed down. And a new round of Russia sanctions was imposed (see Who’s whose flunkey? – Nikki Haley: Another Adherent of the Nothing Creed, Dec 2017). And Nikki scored for again in December 2017, when Trump announced that the US would recognize Jerusalem as capital of Israel (see ANOTHER DAY WHICH WILL LIVE IN INFAMY). What dives Nikki such power? It’s not what. It’s who. And in a word, it is Bibi. Benjamin Netanyahu, Israel’s prime minister, seems to be her real boss and biggest fan. In early March, Netanyahu told Nikki that she was like a “tsunami of fresh air” at the UN. “I wanted to tell you how much we appreciate the defense of Israel and the truth that the president and you bring into these cloistered halls that are so damp, you know, with anti-Israel venom,” Netanyahu said Thursday in his meeting with Haley at the United Nations in New York. “It’s not a breath of fresh air, it’s like a tsunami of fresh air.” (from Times of Israel, Mar 8, 2018). So Haley might as well be recognized as Israel’s ambassador at the UN. And Bibi as America’s real boss. Because the president we currently have at the White House is cow-towing to both of them. On Monday, the tough-talking Nikki Haley, the virtual US president and the unofficial Israel’s ambassador at the UN, announced new and tougher sanctions on Russia. They followed this weekend’s US-UK-French missile attacks on Syria which went unanswered by Russia despite Putin’s bluster and the flurry of his officials’ threats beforehand (see PUTIN: TALK IS CHEAP, ACTION SPEAKS LOUDER THAN WORDS, April 15, 2018). What was Russia’s response to these new sanctions? Moscow has extended overflight privileges of US carriers flying over Russia, hours before they were due to expire, the US State Department said, noting that it continues working with Moscow to secure “benefits” for US companies. The US State Department announced that it has been relentlessly working with Moscow to extend an agreement which allows American passenger and cargo planes to fly in Russian airspace, drastically saving time and fuel on long-distance flights. Hours before the overflight agreement was due to expire at 7:59pm (2359 GMT), the State Department confirmed that Russia granted the much-needed extension. Putin might as well be a card-carrying member of the New World Order. His job is to be a patsy and play a bogey. Because without such “enemies,” the NWO motto – “perpetual war for perpetual commerce” would fail. With such “enemies,” the NWO flourishes. What a bunch of fools the Russians who voted for him last month are. As are the millions of others around the world who see Putin as a hero who will free the world from the American-Israeli hegemony. Yeah, right. Like Philippe Pétain saved France from Hitler? Or Gorbachev saved the Soviet Union from the West? Lest we forget: Putin suggested to Bill Clinton in 2000 that Russia should join NATO. Remember my post, PUTIN: TALK IS CHEAP, ACTION SPEAKS LOUDER THAN WORDS? (April 15, 2018). Well, sometimes talk can actually produce desired results. If it cowers the enemy into backing down in its aggression. Six weeks ago, Putin stole a page out of Teddy Roosevelt’s playbook (Theodore Roosevelt’s letter to Henry L. Sprague, on Jan 26, 1900). He won the battle of a fake Syrian chemical attack without firing a shot. Well, that did not happen, did it? The tripartite US-led coalition fired 103 missiles supposedly at Syrian chemical weapons facilities. And here’s what actually happened, according to the VETERANS TODAY website, which quotes Russian military sources (April 14, 2018): Who is the big bad liar on the US missile attack on Syria? The US and the British fired 103 missiles on April 14. Despite the Pentagon claims that all of them hit their targets, 71 incoming missiles were actually shot down by the Syrian air defenses. There were no Syrian military and civilian casualties. (for a detailed account of each missile target and result see below). So Trump’s much ballyhooed April 14 bombing of Syrian in retaliation to a fake story the US launched which, thanks to the social media, nobody bought, was an unmitigated flop. A noisy night in Syria, to be sure. The US fireworks which produced no casualties. If anything, this incident proved not only that Trump is merely Netanyahu’s pawn (see, but that he is an impotent pawn. It was he, not Putin, who ended up sounding like “all bluster, no muster”. Who is the big bad liar on the US missile attack on Syria? Russian radar and air defense systems in the bases of Hameimim and Tartus were used to detect the American and British missiles and follow their course from the moment of launch of aircraft and warships and British warplanes Tornado above the average and from US aircraft F15 , F16 and strategic bombers B1-B from above the base Altnp occupied by US forces on Syrian territory (which I demanded the bombing started immediately after the start of the aggression on us with land-to-ground missiles) and Tomahawk missiles from warships in the Red Sea Labon & Montarie. The strikes were directed at the military airports, the scientific center and the manufacturing sites. According to the data, there are no casualties between civilians and military personnel. Russian Federation has recently helped the Syrian Arab Republic rebuild its air defense systems, which have largely destroyed the Takfiri terror and at the urging of our Western partners, we have asked Syria to provide it with S-300 air defense systems. But today, we will reconsider this issue not only with regard to To supply Syria with this system, but to provide other countries (sleep, our strategic allies) ……..
Four rockets were fired at the international airport, all of which were dropped. Twelve rockets were fired at Al-Dameer Airport, all of which were dropped. 18 rockets were fired at Bli airport and all were dropped. Twelve rockets were fired at al-Shaerat airport. 9 rockets were fired at the unmanned Mezze airport, 5 of which were dropped. 16 rockets were fired at Homs, 13 of which were dropped. There were no significant losses to these two aircraft and were limited to material. 30 missiles were fired at the residential areas of Barzeh and Jirmana on facilities that the aggression states claimed had research centers and chemical weapons production plants. Seven of these rockets were dropped and the targeted places of equipment and persons were vacated for a long time. We confirm that there are no weapons centers or factories No rockets were fired into the Russian air defenses at the Hameimim and Tartous … Our base was established in Hameim and Tartous in the state of alert and war and our warplane is flying in the Syrian airspace. Nearly 56 years ago, the world was teeter-tottering on the brink of war between the Soviet Union and the United States. The events of October 1962 became known as the Cuba Missile Crisis. In the end, common sense and self-preservation prevailed. And the two superpowers stepped back from the brink of war. What brought that about now that ISIS has been virtually defeated in Syria? The threat of peace. That’s what has caused all these bellicose actions by the warmongers in the US and Israel. Two week ago (on March 29), Donald Trump said the US military should get ready to pull out of Syria. And those words sent the war hawks into apoplexy, especially in Israel which has been using the US military and money as a shield against its enemies in the Middle East. Predictably, there was an alleged “chemical attack” which the lamestream media immediately attributed to the Syrian government. And Trump just as quickly folded his peace rhetoric, and tail between his legs became once again the herald of perpetual wars on behalf of Israel. Wow. Talk about a turn-about-face executed with a military precision by a man who has never served in the military, but one with lots of experience in brown-nosing Benjamin Netanyahu and his war hawks. Meanwhile, Russia’s president Vladimir Putin has once again appealed for peace and common sense. Moscow to Trump: Are ‘smart’ missiles an attempt to destroy alleged chem attack evidence in Syria? Well, that’s not exactly what some other Russian officials have said. Russia’s ambassador to Lebanon said that any US missiles fired at Syria would be shot down and the launch sites targeted, a step which could trigger a major escalation in the Syrian war. Alexander Zasypkin, in comments broadcast on Tuesday evening, said he was referring to a statement by Russian president Vladimir Putin and the Russian chief-of-staff. “If there is a strike by the Americans then… the missiles will be downed and even the sources from which the missiles were fired,” he told Hezbollah’s al-Manar TV (see https://goo.gl/r3bz4B). Suddenly, there has been a re-escalation of war in Syria, followed by another Trump flip-flop. Who do you suppose is responsible for that? I titled the above report “OBAMA’S (AND SAUDIS’) DIRTY WAR.” That’s because the blatant lying to, and the deception of, the American people happened on Obama’s watch and on his orders (2013-2017). But this is by no means an exception. I remember covering an almost identical story in the mid-1990s in Bosnia. Only this time the Liar-in-Chief at the White House was Bill Clinton. And the arms were illicitly shipped to the Bosnian Muslims via various circuitous routes, including Saudi Arabia and Argentina. Some of them even included Iran, a country with which the US has had no diplomatic relations since 1980. On Apr 5, 1996, the Los Angeles Times revealed that Bill Clinton “directly participated” in a decision to let Iran covertly supply arms to the Bosnian Muslims from early 1994 through January 1996 (yes, even as the American troops were being deployed in Bosnia!?). 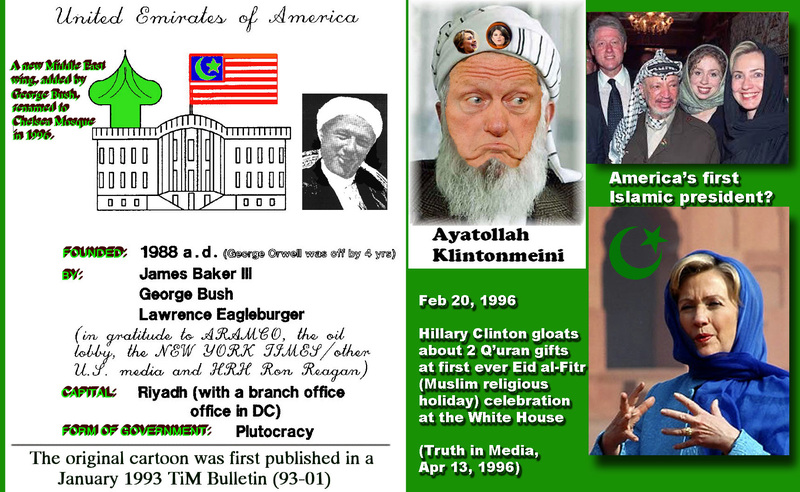 (See Truth in Media report “AYATOLLAH KLINTONMEINI,” Apr 1996 – https://www.truthinmedia.org/Bulletins/tim96-04a.html). And the Argentine newspaper, the Clarin (www.clarin.com), reported in its Oct 2, 1998 edition that illegal arms sales to the Bosnian Muslims via Croatia took place in 1993-1995. Nor is it just the Democratic presidents who have lied and deceived the American people to cover up their “dirty wars” overseas. In the 1980s, Ronald Reagan was also caught redhanded using Iranian weapons to arm the Contra rebels in Central America. Reagan’s VP and successor, George H. Bush, lured Saddam Hussein into invading Kuwait, using it then as a pretext to start the 1st Gulf War. Bush Sr. also helped fuel the wars that destroyed the country of Yugoslavia and brought Islamic Jihad into Europe. And, of course, George W. Bush’s failed deception about the supposed WMD (Weapons of Mass Destruction) in Saddam Hussein’s Iraq has become legendary. It would be a real spoof were it not for the hundreds of thousands of lives that Bush’s deception had cost, including 4,424 American troops. Sometimes you hate to be right. This is one of those times. Donald Trump is a Trojan Horse of the New World Order. Just like I suspected in Feb 2016. WHAT TO DO ON NOV 8? “Bottom line? Vote for any third party candidate who emerges between now and November. Or don’t vote at all. Which is what the majority of Americans has already done. Over 63% of us boycotted the 2014 midterm elections, the lowest turnout since 1824 (see DISGUST & APATHY: BIG WINNERS IN 2014 ELECTIONS). That’s because voting for either a Democrat or a Republican will only serve to legitimize the New World Order’s electoral farce and tighten the plutocrats’ noose around our collective necks. A silent protest is better than a vote for an oppressor. What do I think would actually happen? Yet I voted for Don the Con. I allowed myself to be duped by this conman from New York, just like millions of other Americans. For that, I hang my head low in shame and apologize to my readers. I was right about Trump and about the election outcome. Yet I did not follow my own advice. For the first time in my life, I voted for a candidate from one of the two major parties (Trump). “In the latest of a series of dramatic foreign policy reversals in recent days, Trump dropped an allegation he had repeated throughout his presidential campaign, telling the Wall Street Journal that the Chinese were “not currency manipulators”. Trump’s first flip-flop took place shortly after the Nov 8 election when he backed out of his October debate promise to prosecute Hillary Clinton. He promised to reduce our military deployments overseas, but has instead increased Pentagon’s military budget. And on Apr 13, Trump told reporters that he’s given the military “total authorization.” In other words, a blank check to wage war at will. I don’t know of any other president who has done a foolish thing like that. No wonder that the same day (Apr 13), the US military dropped the GBU-43, a 22,000-pound bomb dubbed MOAB (Mother of All Bombs), allegedly on an IS (Islamic State) target in Afghanistan. MOAB is the largest non-nuclear bomb in existence. (By the way, whatever happened to Al Qaeda and Taliban – our alleged enemies in Afghanistan? Guess they were renamed to IS by the New World Order PR people to make IS supposedly a global threat). In 2013, Trump also said we should get out of Syria and criticized Obama for getting us involved in that civil war. Yet since his inauguration, he has actually accelerated the Syria bombings and our military involvement in that country which is no threat to the United States whatsoever. And now, Trump has also flip-flopped on his earlier stance on both Russia and NATO. So there is no doubt anymore in this writer’s mind that the current occupant of the White House is a liar just like his predecessors. So in 2016, Don the Con pulled off probably the biggest and the longest con of his life. He duped an entire nation and much of the world. And now Trump is shedding his sheep’s hide and to show himself what he has always been – one of the New World Order wolves who only care about money and power. And put Israel’s security and interests, such as in Syria, ahead of those of the American people. … just as this writer said in that Feb 2016 Truth in Media editorial – “IS TRUMP ACTUALLY A TROJAN HORSE?” (of American plutocrats – see http://wp.me/p3QU1S-1fl). This is my first editorial about the 2016 elections. Those who have followed my occasional cryptic comments on Facebook and Twitter about the leading candidates should have a pretty good idea where I stand, and why I have been saying for decades: “Anybody but a Democrat or a Republican.” And so far, there has been no independent candidate who might be worthy of my vote. Like Ross Perot in 1992, for example, who invented “informercials” as a campaign tool, something Trump has also tried to copy. But just look at the difference between Perot’s and Trump’s “infomercials” (image below). Facts versus skin. So now all those naysayers who have been dismissing Trump’s candidacy with “he’ll never make it”-comments are having to eat crow and contemplate “the impossible” – Trump as president of the United States. Until now, we could easily ignore all those bleeding heart liberals and other intolerant factions that make up the Democratic Party’s “borsht” (Russian stew). They have been screaming in desperation and posting hateful messages against Trump for the last year or so. Which proved that they were anything but liberal-minded. And that, of course, includes the establishment media. Their reporting has been highly biased against Trump. Some even stooped as low as to use profanities. Which only cheapened their arguments. Furthermore, ALL of the “lamestream” media posted photos of Trump in the most unflattering angry poses – scowling, shouting, threatening – evidently trying to associate him with images of past dictators in history. That was no “coincidence.” It was and is a carefully orchestrated hate campaign against Trump by the media that’s supposed to be neutral when it comes to news reporting. And now, after Nevada, and certainly after next week’s “Super Tuesday” in which 13 states will choose their favorite candidate, the Republican establishment is finding itself in the same boat as the liberal media. Trump is winning and everybody is panicking. IS ANTI-TRUMP MEDIA RHETORIC ANOTHER CHARADE? Or are they? Are they really panicking or merely following another carefully scripted New World Order ruse, the latest twist in the devious plot intended to deceive the American electorate? Why would they do it? Because Trump is one of their own. Anybody who has been watching Trump’s public persona well before he declared his 2016 candidacy would have seen seen a crass man with a giant ego and little regard for anything but money. Which is exactly what all the New World Order chieftains also worship – the Almighty Dollar. During the last quarter century, the New World Order plutocrats have usurped the U.S. government powers and turned it against the once free people – the electorate, the sheeple, the disenfranchised Americans whose only guaranteed right is to keep on paying taxes to pay for the public debt which the rich line their pockets. And Trump is very much a part of that crowd. But more than just appearances, Trump shares with them same same “religion” – the Love of Money. The New World Order Creed fits Trump to a tee. Their creed is ‘I believe in nothing!’ Their crest: The Almighty Dollar. Their object of worship: The Golden Calf. Their holy shrine: Wall Street. Their holy water: Coca-Cola. Their disciples: Washington politicians. …to a standing ovation by the delegates in attendance, including Pat Buchanan. All of those who voted Obama now know the pain of disappointment over broken promises. As do those who voted for the two Bush’s and Clinton before them. I have voted for none of them. So my conscience is clear. Sanders, like the Clintons, is a party loyalist trying to look like an outsider to distinguish himself from Hillary. Trump is a card-carrying member of the billionaires club – the 563 plutocrats, out of 319 million of us, who have been getting richer while most of the American people are getting poorer. “Those who deformed us cannot reform us,” read a crude white painted slogan on a Prague wall during the 1989 Velvet Revolution. So the only person who can truly change the corrupt political system in America is an outsider, neither a Democrat or a Republican. Bottom line? Vote for any third party candidate who emerges between now and November. The forces of the Evil Empire – the so-called New World Order who field most of the Democratic and Republican candidates – had pulled out all stops in their vicious attacks on the leading Republican candidate. They compared him to Hitler. They linked him to the KKK. They accused him of cheating on taxes. They even invoked the lowly Mussolini, trying to associate him with Trump. The New World Order media whores – as if following orders – invariably depicted Trump in their photos as a grimacing, angry bear. It was a clear as night and day that this was a Madison Ave-style orchestrated campaign aimed at destroying Trump. But they did not mention Trump’s quote in which he praised Vladimir Putin, the Russian president, as a strong leader who is “making mincemeat out of our president” (Obama). Two closest Republican candidates – Cruz and Rubio, both establishment whores – elevated their criticism of Trump in the last few days to a fever-pitch scream, dropping any pretense of decency and gentility in their campaigns. And after all of these dirty tricks… all of them still came up short. The electorate in the 13 states – from Massachusetts to Alabama – turned thumbs up on Trump and thumbs down on the New World Order. So Trump appears unstoppable now, at least by any legal, above board means. Which, of course, leaves the New World Order leaders their favorite tools – the underhanded or violent means of stopping him. Or not. If underneath the veneer of a renegade Republican we discover that Trump is also one of “them” (for more on that, see IS TRUMP ACTUALLY A “TROJAN HORSE?” – http://wp.me/p3QU1S-1fl). At a CNN town hall event on Tuesday night, Trump reversed on that promise, telling CNN moderator Anderson Cooper he no longer respects the so-called loyalty pledge a stage full of then-candidates agreed to during the very first GOP debate in Cleveland last August. So that’s today’s news from the campaign trail. What does it mean? WHAT DOES TRUMP’S REVERSAL MEAN? It means that Trump is clearing the deck if he is forced to run as an independent. Which would happen if the GOP officials manage to sabotage in some illegal way Trump’s seemingly inexorable march to the Republican nomination. And if Trump were to run as an independent, he would probably win every day of the week and twice on Sunday. Because he would garner even more popular votes than as a Republican candidate. Who knows, Trump may even get my vote if that were to happen. Because he would have proven that he is not a “Trojan Horse” as I had feared in my Feb 24 editorial (“IS TRUMP A ‘TROJAN HORSE’? – http://wp.me/p3QU1S-1fl). Trump will get the Republican nomination. And I will sit on my hands again come Nov 8. Ted Cruz was actually born in a foreign country — Canada — to an American mother, Eleanor Darragh, and a father, Rafael Cruz, who was a Cuban citizen at the time. Ted was born on On Dec. 22, 1970 in Calgary, Alberta. His father, born and raised in Cuba, actually did not become an American citizen until 2005. When Ted Cruz was born, his parents weren’t visiting Canada or working on a military base — they had lived there for years. Young Ted himself lived in that foreign country for the early years of his childhood and was actually a Canadian citizen until he renounced it in May of 2014. ALTZAR: The Constitution is clear about the fact that a candidate for President of the United States must be a natural-born citizen. So why are so many Americans participating in this charade and voting for an INELIGIBLE candidate? Wasn’t Obama’s birther issue controversial enough? More importantly, does this country really need another professional liar in the White House? THE GUARDIAN: TRUMP BATTLING FOR THE SOUL OF THE REPUBLICAN PARTY? I thought it was hogwash. And so did many other readers. “The rise of Donald Trump is a battle for the soul of the Republican party?” What nonsense! The rise of Donald Trump is a sign of the American people finally pushing back against the usurpation of power by BOTH the Democrats and Republicans who use taxpayers money to serve the interests of big banks and big business. Let us not forget that Trump is the ONLY candidate using his own money to get elected. So he will have to answer to no one but the American people when he is elected. THE GUARDIAN – By Ben Jacobs. a political reporter for Guardian US based in Washington DC. “I have never heard more contradiction in one hour than I heard in the speech,” Sierra Club director told the Guardian. Finally, the mask has dropped. And we had a chance to see the real Donald Trump as I hinted in my February editorial – TRUMP ACTUALLY A “TROJAN HORSE?” – http://wp.me/p3QU1S-1flIS. Ironically, moments before delivering his speech, Trump had just crossed the 1,237-delegate mark which assured him of the Republican nomination long before the national convention. It is hard to believe such a level of ignorance by the leading candidate for President of United States. Of course, Hillary is worse. She has already taken tons of money from Wall Street and the oil and gas industry, including the Arabs. Donald Trump pledged to cancel the Paris climate agreement, endorsed drilling off the Atlantic coast and said he would allow the Keystone XL pipeline to be built in return for “a big piece of the profits” for the American people. At an oil and natural gas conference in North Dakota on Thursday, just minutes after he had celebrated hitting the 1,237 delegate mark needed to formally clinch the party’s nomination, Trump gave a speech on energy policy that was largely shaped by advice from Kevin Cramer, a US representative from the state. In a press conference before the event, Trump praised the advice of oil tycoon Harold Hamm. Hamm and Cramer then introduced him onstage. Michael Brune, executive director of the Sierra Club environmentalist group, was taken aback by Trump’s address. “I have never heard more contradiction in one hour than I heard in the speech,” he told the Guardian. “What do I think would actually happen? It pains me when something like this happens. I feel no joy writing another “I told you so” comment. For, I remember vividly saying the same things about Obama back in 2008 when so many people around this country were euphoric about his presidential aspiration. I concluded my Feb 24 Truth in Media editorial – “IS TRUMP ACTUALLY A ‘TROJAN HORSE?’” – by saying “ANYBODY BUT A DEMOCRAT OR A REPUBLICAN” (see the image) – http://wp.me/p3QU1S-1fl . Maybe now I can add a subhead to that piece: “BERNIE: HILLARY’S TROJAN HORSE”. Here we go again. We have another Bozo in the White House. Only this one does not ride a horse or wears a Texas size Stetson. A New York “Dubya Reincarnate” has now also bought the Israeli and CIA BS about the chemical weapons in Syria against reason and common sense. Even if the Syrian government did have the alleged chemical weapons, which the Russians say they don’t, why on earth would they gas their own people and bring about a world outrage? It makes no sense. The only parties who might benefit from such scenario are the New World Order warmongers, starting with Israel. Just like they did in Sarajevo in 1992 and 1994 and elsewhere around Europe, Canad and Australia with their “false flag” attacks. And now these evil warmongers have got our new president buying their BS, just like George W Bush did back in 2001-2003. The WMD were never discovered in Iraq. The entire war that cost over 100,000 lives was a New World Order hoax whose purpose was to protect the security of the state of Israel. And now, with a new White House Bozo who has no experience in foreign policies and evidently no intention to learn from history about to make the same mistake. How many more American lives will this cost us? Most Americans are aware by now of HIllary Clinton’s criminal or corrupt activities, both as Secretary of State during the first Obama administration (2008-2012) or in her prior and subsequent life. To get away with such travesties, one would have to be either extremely smart or have very powerful friends. Well, by the time you’re finished reading this story, you will realize that it was the latter – powerful backers – that allowed Hillary to get away with murder(s) and other criminal or treasonous activities. Certainly not her smarts. Because she demonstrated early on in her tenure as Secretary of State that she is both extremely stupid and stunningly incompetent. Hillary’s first major foreign policy initiative after being confirmed as Secretary of State was to improve the United States’ relationship with Russia. To that end, she traveled to Geneva, Switzerland in March 2009 to meet with the Russian foreign minister Sergei Lavrov. At the meeting, Hillary presented Sergei Lavrov with a red button with the English word “reset” and the Russian language Latin alphabet transliteration “peregruzka”. It was supposed to be the Russian word for “reset”. Clinton explained that she wanted to reset relations between Russia and the United States. “We worked hard to get the right Russian word. Do you think we got it?” Clinton asked Lavrov. In other words, the gift implied hostility, rather than peacemaking. But Lavrov took pity on Hillary and the two pressed the button anyway. ALTZAR: “We have worked hard to get the right Russian word,” said Hillary. The State Department has has a budget of $65 billion and 13,000 employees whose job is to speak and understand foreign languages. And they all “worked hard” to get the translation of a single word wrong? I just did it with Google Translate in less than 15 seconds (see below). That’s how Hillary’s tenure as Secretary of State started – with a major public gaffe on a world stage in Geneva. And now that kind of a dolt wants to be president? Or was she picked by the New World Order powers that be for the role just because she is a useful idiot like GW Bush willing to carry out their devious schemes without question? “Hell Hath No Fury Like a Woman Scorned” (William Congreve [1670-1723], The Mourning Bride). When Hillary Clinton became Secretary of State in Jan 2009, improving the U.S. relations with Russia was one of her top priorities. In March 2009, she traveled to Geneva to meet with Sergey Lavrov, Russian foreign minister, to make that point. Despite a linguistic gaffe she committed (see HILLARY GOOFS ON RUSSIAN “RESET” TRANSLATION), Lavrov accepted her olive branch and passed it on to the Russian leader at the time – Dmitry Medvedev. Hillary’s new policy paid dividends. Initially. With Putin focused on domestic matters during a four-year stint as prime minister, Medvedev opened up a new corridor for U.S. forces and materiel heading to Afghanistan as part of the U.S. surge in the war. After missile defense concessions by Obama, the two nations sealed their most ambitious arms control pact in a generation. Washington and Moscow united on new Iran sanctions. Years of trade negotiations culminated in Russia’s entry into the World Trade Organization. Hillary made Russia feel as if had become “one of us,” a full-fledged member of the New World Order globalist club. It was a bait that Medvedev gullibly swallowed. But not Putin, again thanks to Hillary’s machinations elsewhere in the world – Libya. Even before Putin’s first two terms as president, Russia had always opposed U.N. Security Council action that might lead to a leadership change. As America’s European allies sought a military intervention against Libyan dictator Moammar Gadhafi, Clinton play-acted the role of skeptic, pretending to refuse to jump aboard at first. When she finally did, it proved critical in persuading Russia to abstain (i.e., yo tacitly approve of the action). Relations soured further by the end of the year (2011). Putin won a new, six-year presidential term in March 2012. Fast-forwarding to June 2012, “seeking Russia’s cooperation, Obama and Clinton avoided any talk that might threaten Russian equities in Syria, including a large naval base there. Their message was clear: The U.S. wouldn’t try to pull a future post-Assad government out of Moscow’s orbit. It didn’t matter. When the U.N. proposed a peace plan that involved ushering Assad out of power and included penalties for noncompliance, the Russians balked. Faced with stalemate, the U.S. and Russia arrived at a formula for a new government comprised of individuals chosen by the “mutual consent” of Assad and the opposition. Either way, Hillary’s “Russian Reset” was all but dead in water. Hillary did make one final push to try to save it. With Obama busy with his second election campaign, she led the U.S. delegation at the APEC summit in Vladivostok, Russia in September 2012. Addressing the summit, she congratulated Russia on joining the WTO and said it could pay off big for Moscow. Hillary and Putin even engaged in some private schmoozing, as evident from these photos. But the warmth soon evaporated as John Kerry replaced Hillary in early 2013. Soon, he and Obama set sights for an invasion of Syria. And Putin publicly called Kerry a liar. And then in June 2013, Snowden happened. And then in February 2014, they State Department and its various stooges like John McCain and Hillary engineered a coup in Ukraine. And then in March 2014, Russia grabbed Crimea back. And the Cold War was back full on. By late July 2014, Hillary compared Putin to Hitler as she urged the European countries to impose sanctions on Russia in the aftermath of the downing of the Malaysian Airlines MH17 over Ukraine. Which the Russian military proved was the western design carried out by the Ukrainian government. And in 2016, Hillary called Putin a “bully” and blamed him for many of her election woes, including the hacking of the DNC emails. Investor’s Business Daily: HILLARY A PUTIN PAWN? And then came the blowback – the alleged Russian hacking of the DNC emails. Not to mention Russia helping Turkey’s president Erdogan fight off an attempted July 15 military coup, which appears to have been a botched CIA operation. Hell hath no fury like a Russian ruler scorned. Lest we forget, Vladimir (Влади́мир) means World Ruler or Peace Owner in Russian. Also see… IS PUTIN NAIVE OR COY? – http://wp.me/p3QU1S-yl (Nov 2014). You would think that calling for someone assassination publicly on national TV would be good cause for arrest and criminal charges being laid. Evidently not so if a person is part of Hillary Clinton’s gang. WAS MURDERED DNC STAFFER WIKILEAKS’ SOURCE? On the other hand, here’s a video of a TV interview Assange gave to a Dutch TV network yesterday in which he all but confirmed that the murdered DNC staffer Seth Rich may have been the source of the DNC email leak (discussion starts at 8:42 min of the video). ALTZAR: Now I understand why Wikileaks offered a $20,000 reward for information about this DNC staffer’s murder. ALTZAR: Boy oh boy, things are getting really ugly out there. “Tempt not a desperate man,” Shakespeare wrote in Romeo and Juliet. For desperate men do desperate things. Hillary, her New World Order sponsors, the DNC and GOP and the lamestream media are all getting desperate. For the first time in over a century, they are LOSING. And they feel the ground shifting under them. So they are putting up one last desperate stand with no holds barred. This revelation also makes it quite funny that Hillary, the DNC and the rest of the establishment media immediately upon the Wikileaks release of the damaging emails engaged in deny, distract and deflect tactics – blaming Putin and Russia for hacking into the DNC server. Well, desperate men do desperate things. Or in DNC’s case – desperate women who seem to be in charge of the DNC at the top. See http://www.whatreallyhappened.com/RANCHO/POLITICS/BODIES.php for detailed descriptions of each murder along with the victims’ photos. Warning: This may be lost on some among younger generations who have never heard of The Addams Family TV show (1964-1966). But since they are not likely to vote for Hillary anyway, that’s no great loss. The Baby Boomers, however, especially the middle-aged women who are apparently Hillary’s most ardent supporters, may take a good long look at this image. The rest of us? Well, we can just chuckle. 🙂 For sometimes, real life mimics art, even if half a century later. They say “birds of a feather flock together.” That includes past and hopefully future jailbirds. He admitted scamming his friends and family out of $10 million in a Ponzi scheme. Meanwhile, Marc Mezwinsky and his wife Chelsea Clinton continue to live high off the hog in their $10 million penthouse apartment that spans an entire New York City block (see below). Losses be damned – to others, not the Clintons and their in-laws. TURKISH COUP FAILURE: BEGINNING OF THE END OF NATO? And then, as I dug more into what was going on in Turkey, I concluded that if Erdogan prevails and the coup fails, this may be the beginning of the end for NATO. So on July 16, I published three stories on Facebook explaining why (see below – NATO – R.I.P? CARL BILDT ON TURKISH COUP SOUNDING JUST LIKE OBAMA – https://www.facebook.com/bob.djurdjevic/posts/10208116037273590). DID RUSSIA SAVE ERDOGAN’S LIFE? LITERALLY. Here’s a story from the Russian media (http://u-f.ru/News/society/u56/2016/07/20/229858) about how its intelligence services allegedly intercepted the communications between the coup plotters and warned the Turkish president Erdogan in time for him to leave the place in Marmora where he was vacationing. In the meantime, several other sources have come around to the same conclusion. And it is that very base that Erdogan had shut down in the aftermath of the coup, by cutting the power to it (see below and https://is.gd/fapEcU). So as more and more experts are coming around to realizing the failed coup in Turkey may spell the beginning of the end of NATO, and the start of liberation of Europe from the shackles of Washington. And not just Europe. Because like cancer, the U.S. military is spread far and wide around the world. The best way to fight cancer it to surgically remove it. Which is what the new Turkey-Russia alliance may start to achieve. Check out the tweet below from Carl Bildt, a former Swedish prime minister who had been a cheerleader of the Ukrainian coup, and also a chief magistrate of the New World Order’s version of “peace” in Bosnia before that. In other words, one of the New World Order insiders from way back. For Americans though, perhaps the most interesting thing about this news clip is that both Bildt and Obama used the virtually identical language to describe what happened in Turkey in the last day or so. Obviously, this suggests a rehearsed duplicitous response by the New World Order chieftains to a faIled coup which was engineered by the CIA, using the U.S.-based cleric Fethullah Gulen, who lives in Pennsylvania, as a CIA patsy, according to Wikileaks. Speaking to a huge crowd in Istanbul on Saturday night, the nearly deposed Turkish president Erdogan demanded that the United States extradite the cleric. “Once they hand over that head terrorist in Pennsylvania to us, everything will be clear,” he told the crowd. ALTZAR: Actually, nothing will be clear. Because the Obama administration is unlikely to extradite anyone with whom the CIA had been in cahoots. About the only thing that seems to be clear so far that what happened in Turkey in the last 48 hours has created a huge rift in NATO. And one more thing – the motive. Why would the U.S. want Erdogan gone? The Turkish president had become a liability for the U.S./NATO last month when he sent a letter of apology on June 27 to Vladimir Putin for the downing of the Russian SU24 plane over Syria. Two days later, Putin telephoned Erdogan and accepted his apology. “The Russian and Turkish presidents agreed to study the possibility of near-term summit meeting between them. And that, must have sounded alarm bells throughout NATO. Losing Turkey to Russia’s sphere of influence would be disastrous for NATO. That would be like removing the sacrum from a spine in human body. In other words, the whole structure would collapse. And who knows, now after the failed coup in Turkey, God willing, it might. NATO – R.I.P. A massive DDoS attack was staged on the servers of the Internet service provider that provides web streaming for the RT TV channel during the coverage of Friday’s attempted coup in Turkey, briefly taking the stream offline. The channel was able to resume streaming, but the servers were attacked again after some time. The RT website have been targeted by a number of DDoS attacks. In September 2014, the site was subjected to the biggest DDoS attack in its history, which was repelled by its tech specialists nonetheless. ALTZAR: For those who may not be familiar with RT.COM, this channel has become what the Voice of America used to be during the early years of the Cold War. RT is where millions of people around the world turn to when they want to learn the truth about what’s really going on, especially in the U.S. and the West. So given that, who do you suppose would have had the strongest motive to try to silence the live streaming of the events during the coup attempt in Turkey? RT targeted by massive DDoS attack during attempted Turkey coup https://www.rt.com/news/351645-rt-massive-ddos-attack/?